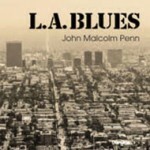 This third Blue Night Records (BNR) release from John Malcolm Penn is yet another pearl in a growing string. As in his previous two projects for us, he wrote all the melodies and lyrics, played all the instruments, and sang all the vocal parts. His style and sound are instantly recognizable. If you’ve ever lived in L.A., you know about the importance of escaping every once in a while — perhaps up the coast to Jenner, maybe the wine country of Sonoma, to Red’s Meadow near Mammoth Lakes, or even to Lake Elsinore. Get ready to travel, because John’s music and lyrics will take you places. He’s a gentle spirit. An old soul. You couldn’t have a more caring scout/wagon master leading you down paths unknown. Blue Night Records is once again proud to present another glimpse into the artistry, creativity and musicality of John Malcolm Penn.